We breed high quality lines with outstanding wool production. German angoras are easy to handle and they have been selected over the years to have excellent dispositions. Their coats are dense and matt free. Many of our animals are IAGARB registered or come from IAGARB registered lines. Occasionally we have young rabbits available. Bunnies are not sold before 12-16 weeks of age. If you are interested in a bunny and would like to be put on the waiting list, please contact me. A non refundable deposit is normally required to hold a rabbit. I will ship, depending on weather conditions. Airlines usually restrict animal shipping during the hot summer months and very cold winter months. 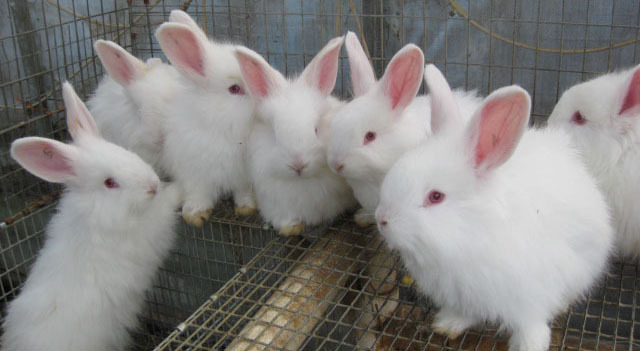 At Bungalow Farm, we specialize in quality 100% German angora with high wool yields. Hi Bunny, we are in Northern California. Thanks for your visit! Ouch you make me long for the bunnies. Our daughter Annie spent two years plus raising Angoras as 4-H and had Best Wool in Show at Fresno Fair one year. If the dairy goats weren’t so darn time consuming I would have them again.